Smart move by GM to invest in Lyft – perhaps they see the disruption coming to the car ownership model that self driving cars will bring, and are hedging their bets. Interesting that Google gets all the press on self driving cars while Detroit is seemingly under emphasizing the future of self driving cars. A great article here on GM’s venture into the self driving cars. The problem is the entrenchment and lack of original thinking by the incumbents. The market leaders have to worry about protecting their existing business model for as long as possible – hampering the adoption of the technologies and business models. Detroit seems to be in that category – I am sure margins are much higher selling cars to individuals and executives will fight to keep the existing model (and short term profits). Maybe GM’s tiny investment in Lyft shows there is some chance that they can re-invent themselves – but I am skeptical. Fed easing correlates to oil production? His thesis is the overproduction of oil in the US may have been driven by all the excess money the Fed pumped into the economy. All this low interest capital was put to work drilling and selling oil. An interesting hypothesis – at first glance it seems to be to unrelated graph lines that happen to correlate, but after thinking about it a bit I have to wonder. If you assume the oil production companies are backed by investment funds, rather than earnings, this chart would indicate they are still holding themselves up by draining investment funds. 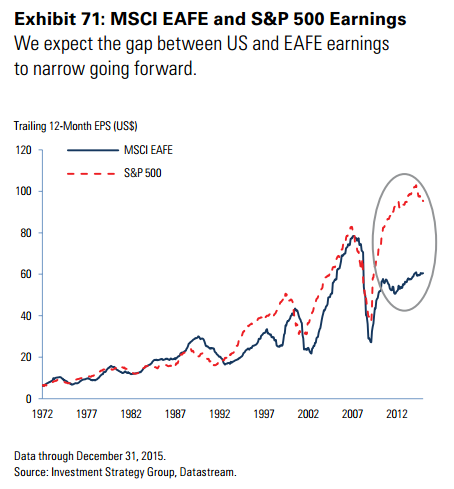 But assuming oil prices stay low, the game will be over in a few quarters. 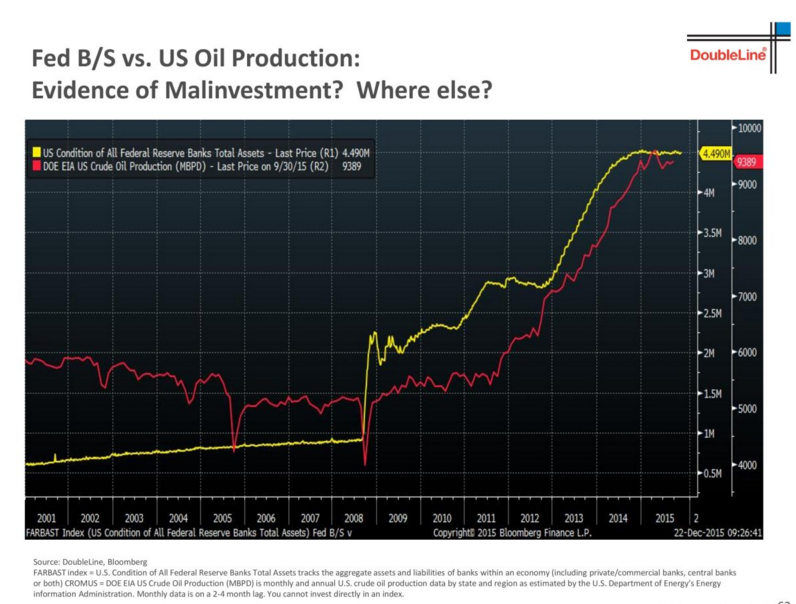 Reading this chart (as found in this Goldman Sachs presentation) tells me international developed markets appear to be underpriced, If true, and assuming they have invested less vigorously in the oil production space, they will be helped more by cheap energy prices than the S&P 500. Many of these markets are also in countries where their government is doing some form of QE, pumping money into the economy, which is bullish for stocks. 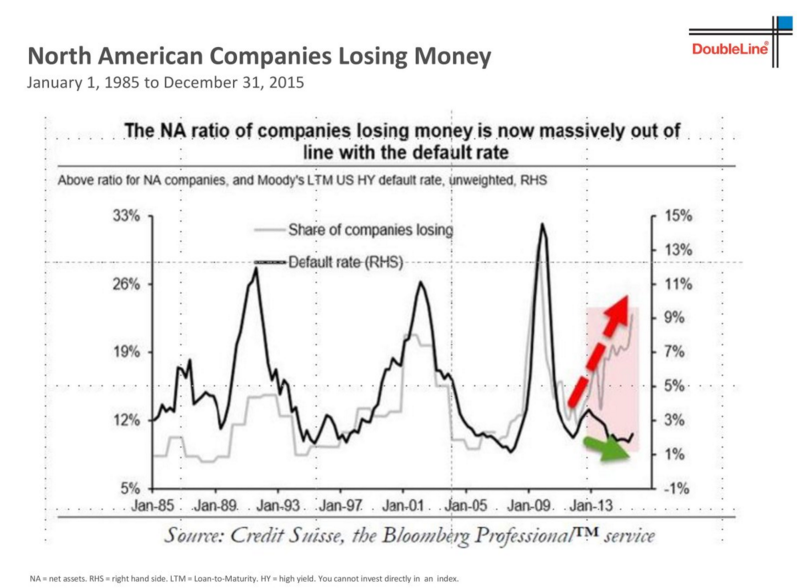 If history is any indicator, these countries will be investing all this low cost money on the next economic bubble. A quick rant – though I know this article is over a month old. 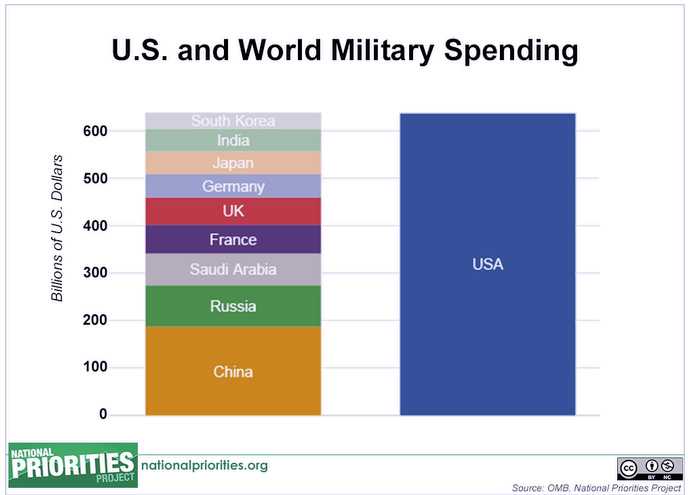 Wow – I guess we should throw a few more billion at the military budget. Lets see… 20,000 bombs, and we have killed 23,000 ISIL fighters – yet the movement continues to recruit replacements. So effectively once could calculate easily that each bomb produces under 1 enemy casualty (lets assume that for each casualty we recruit .5 replacements) – no statistic on how many innocent people are killed. This is really our best strategy? But hey – what else should we do with American tax dollars – its not like we need to save money or anything. I had chance to pull the stats from the solar panels I installed in mid-January 2015 (more details here) – and there is some good news and bad news. The good news: My total power production for the year (from mid-January on) was 4005.5 kilowatts. We had a pretty optimal year for solar – lots of sunny days in the summer long days, and a rainy winter when solar production is pretty much a non-issue. My solar contractor who installed the system gave me a solar power production prediction before the install, and they estimated first year power production of 3886 kilowatts – which I beat by 3.1%. So they were pretty darn accurate. The bad news: Solar power incentives will be dropping in 2016. Much of my payback analysis was based on the Washington State incentive structure providing 54 cents per kilowatt – the projected 2016 incentives as shown here show a much lower incentive rate. This will stretch out my payback – and it will be interesting to see what impact this will have for the expansion of solar in the Northwest. At the predicted incentive rates, new installations would have a much increased payback period. Having said that, I don’t regret the decision. Much of the cost of the system install was for the production meter installation – setting me up for future expansion of panels or replacement of existing panels with more efficient ones. I still envision the day when panels will be low cost, but the cost of retrofitting houses to produce power will not be going down. To be fair I do have some tree issues which greatly reduce my production in winter – but if you are planning on visiting in December you can likely leave the sunscreen at home (My top power day in December was 3.55 kilowatts on 12/31). My total power consumption for the year was 8055 kilowatts, so I produced approximately 50% of the electricity I used for the year. I will be watching this trend over the years- in theory as lighting gets more efficient and panels get more efficient – I should be able to raise that percentage. So my first year is in the books and I consider it a moderate success. If you are planning on a solar install in the Pacific Northwest – and have any questions or comments – please feel free to add a comment below.